I had some fantastic sightings this week here at Beho Beho; the first one was wild dogs, followed by mating Lions and then Lions with Giraffe a carcass. On our first sighting it was really good and amazing because we found wild dog lying down and some of them a little more active after finishing their meal, there were two Hyenas nearby waiting for the dogs to leave so that they could look around for the left overs, we spend almost thirty minutes enjoy how lovely they are, before we moved to the sundowner spot to finishing up our evening with drinks. The second sighting was mating lions. Two Lions and one Lioness, Two Lions? Yes because Lions have their honeymoon for almost four to five days and every ten to twenty minutes they mate, day and night, it’s not an easy task, so another male will be nearby waiting for an opportunity to arise should the other male get tired. Funny, but that’s nature, everyone want to make sure they pass their genes on before death, it doesn’t matter how risky it is. 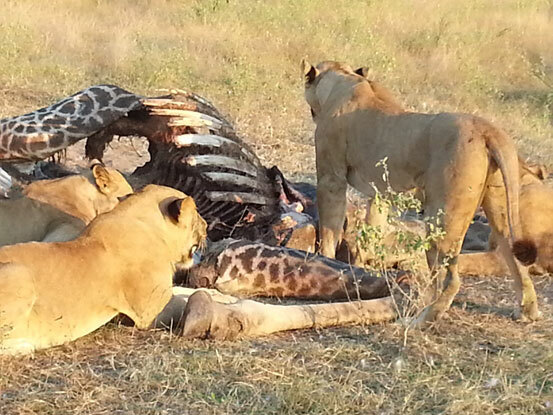 The last sighting was Lions with a Giraffe carcass just after the Msine crossing. It was a full grown male Giraffe, seems to me it died a natural death because we saw a lot of Hyena tracks around and also a lot of Vultures feathers, which means they were there before Lion. This entry was posted in Godlisten, Wildlife and tagged Beho Beho, camp, Godlisten, lions, safari, selous, wild dogs. Bookmark the permalink.